218-220 Beacon are located on the north side of Beacon, between Clarendon and Dartmouth, with 216 Beacon to the east and 222-224 Beacon to the west. 218 Beacon and 220 Beacon were built ca. 1863, designed as a symmetrical pair of houses, with 218 Beacon one foot wider than 220 Beacon. 218 Beacon was built for Alanson Tucker, Jr., and 220 Beacon was built for his brother, William Warren Tucker. They bought the land for the two houses on January 7, 1863, from attorney William Dehon, the western 41 feet of a 100 foot wide lot he had purchased on June 13, 1862, from the Boston and Roxbury Mill Corporation. When he sold the lots to the Tuckers, William Dehon included language in the deeds specifying that the height and depth of any house built on either lot was to conform with the house at 216 Beacon, and the height of any stable built at the rear of either house was to be no more than thirteen feet. Click here for an index to the deeds for 218-220 Beacon. From 1905, 218 Beacon and 220 Beacon were owned by the Bradford family. 218 Beacon was converted into apartments in the mid-1940s, and 220 Beacon was converted into apartments in the mid-1950s. In 1956, 218 Beacon and 220 Beacon were acquired from the Bradford family by retail liquor dealer and real estate investor Fred L. Arata and his wife, Annette Flossie (Crovo) Boggiano Arata. They operated both as apartment houses. In 1961, they were acquired by 220 Beacon Realty, Inc. which, in 1963, combined them into a single apartment building with the address of 220 Beacon. It was at that time that the façade was “modernized,” including consolidating the two entrances and relocating them to street level. 220 Beacon remained an apartment building in 2016. 218 Beacon was built as the home of Alanson Tucker, Jr., and his wife, Margaret Grant (Chadwick) Tucker. They previously had lived at 1 Louisburg Square. He was a commission merchant and former attorney. Alanson Tucker died in December of 1881. Margaret Tucker continued to live at 218 Beacon until her death in January of 1889. On January 26, 1889, Alanson Tucker’s estate transferred the property to the Tuckers’ only surviving child, Anna (Tucker) Phillips, the wife of John Charles Phillips, Jr.
On March 14, 1889, 218 Beacon was purchased from Anna Phillips by Eliza Edes (Hickling) Bradford, the widow of Charles Frederick Bradford, a shipping merchant in the China trade. who had died in August of 1887. They had lived at 2438 Washington. Their son-in-law and daughter, Dr. Elbridge Gerry Cutler and Fanny Gore (Bradford) Cutler, lived at 214 Beacon. Charles and Eliza Bradford’s son, Dr. Edward Hickling Bradford, lived with her at 218 Beacon. He was a physician and surgeon, and later would become Dean of Harvard Medical School. He previously had lived at The Aubry at 149 Newbury. He also had maintained his office there, and continued to do so after he moved to 218 Beacon. Edward Bradford married in June of 1900 to Edith Annie Fiske. Prior to their marriage, she had operated a kindergarten school at 140 Marlborough. After their marriage, they lived at 218 Beacon with his mother until about 1902. They then moved to 249 Beacon, where they lived until about 1905. In August of 1905, they purchased and moved to 220 Beacon. Eliza Bradford continued to live at 218 Beacon until her death in July of 1916. The house was inherited by Edward Bradford. In September of 1917, Edward Bradford applied for (and subsequently received) permission to remodel portions of the interior and installed a fire balcony on the rear fifth floor. The house remained a single-family dwelling. By the 1918-1919 winter season, 218 Beacon was the home of Mrs. Elizabeth Loring (Clarke) Fitz, the widow of Dr. Reginald Heber Fitz. Their unmarried children, Edward Clarke Fitz and Edith Fitz, lived with her. They previously had lived at 18 Arlington. She also maintained a home in Manchester. Reginald Fitz had been a physician and professor of Pathological Medicine at Harvard. He is credited with identifying the cause and treatment of appendicitis. Elizabeth Fitz died in December of 1928 and her son, Edward, died in April of 1929. Edith Fitz moved to Brookline. During the 1929-1930 winter season, 218 Beacon was the home of investment banker Barrett Wendell, Jr., and his wife, Barbara (Higginson) Wendell. He was associated with Lee, Higginson & Co.’s Chicago office. They had lived in Chicago in 1929 and were once again living there in 1931. 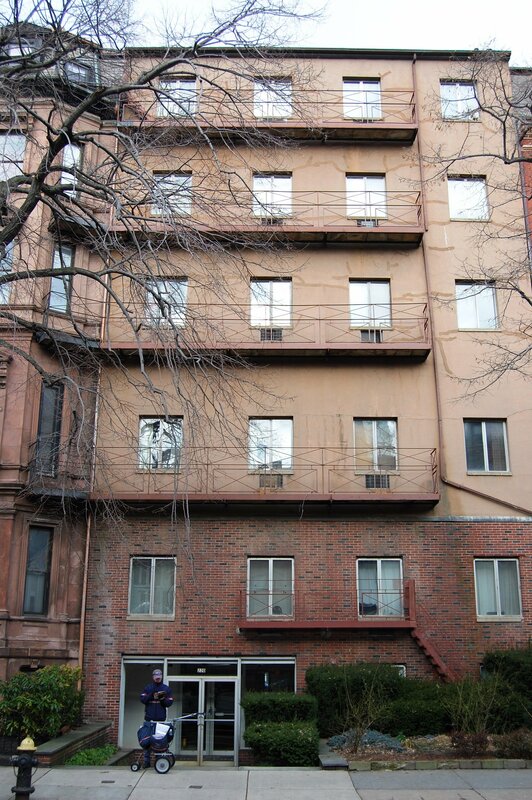 218 Beacon was not listed in the 1931 Blue Book, and by 1932, Edith Fitz was living there once again. She had moved back to Brookline in 1933. The house was not listed in the 1933 Blue Book and was shown as vacant in the 1933 City Directory. By the 1933-1934 winter season, 218 Beacon was the home of Rev. Palfrey Perkins, minister of King’s Chapel in Boston, and his wife, Linda (Wellington) Perkins. They previously had lived in Buffalo, New York, where he had been minister of the First Unitarian Church. They continued to live at 218 Beacon in 1935, but had moved to 90 Beacon by 1936. 218 Beacon was shown as vacant in the 1936-1943 City directories. 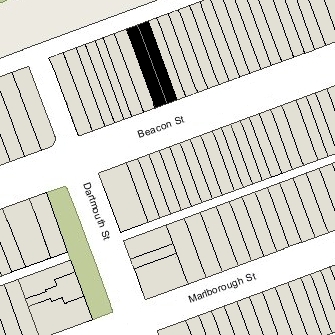 By 1943, 218 Beacon was being occupied as a multiple dwelling, either a lodging house or apartments. Dr. Edward Bradford had died in May of 1926 and 218 Beacon and 220 Beacon were owned by a trust established in his will. In October of 1946, the trustees applied for (and subsequently received) permission to convert 218 Beacon into nine apartments. Edward and Edith Bradford’s son, Robert Fiske Bradford, was one of the trustees. He served as Governor in 1947 and 1948, and 218 Beacon became the center of some controversy because Governor Bradford was accused of converting his property into high priced apartments at a time where there was a severe shortage of low cost housing. In a February 5, 1947, Boston Globe article, he explained that two of the apartments would be used by his brothers, both of whom were veterans. 220 Beacon was built for William Warren Tucker, whose brother, Alanson, built and lived at 218 Beacon. William Tucker and his wife, Susan (Lawrence) Tucker, lived at 98 Beacon. He was a dry goods commission merchant. On May 13, 1864, 220 Beacon was purchased from William Tucker by Israel Goodwin Whitney. He and his wife, Christiana Kadie Swan (Sargent) Whitney, made it their home. Israel Whitney was a shipping merchant in the East India trade. They previously had lived in Calcutta, returning in 1864 and living briefly at 9 Allston before moving to 220 Beacon. By 1868, they had moved to West Roxbury. On October 6, 1868, 220 Beacon was purchased from Israel Whitney by commission merchant Charles Lowell Andrews. He and his wife, Sarah (Jeffries) Andrews, made it their home. They previously had lived at 60 Bowdoin. They continued to live at 220 Beacon in 1872, but moved thereafter to 175 Marlborough. By 1873, 220 Beacon was the home of Aaron Hall Allen and his wife, Angie N. (Sturdevant) Allen Allen. They previously had lived at 1500 Washington. He was a dealer in furniture, feathers, and related items. On May 1, 1874, Aaron Allen purchased 220 Beacon from Charles Andrews. Living with the Allens was Elizabeth James Allen, Angie Allen’s daughter by her first marriage to James Bowdoin Allen, a lawyer, who had died in December of 1853. Elizabeth Allen married in November of 1875 to Artemas Henry Holmes, a lawyer from New York City. Aaron Allen died in June of 1889. In his will, he left 220 Beacon to his wife. Angie Allen continued to live there until her death in March of 1904. In her will, she left 220 Beacon to her son-in-law, Artemas Holmes (her daughter had died in September of 1876). On August 8, 1905, 220 Beacon was purchased from Artemas Holmes by Dr. Edward Hickling Bradford. He and his wife, Edith (Fiske) Bradford, made it their home. They previously had lived at 249 Beacon, and before that at 218 Beacon with his mother, Eliza Edes (Hickling) Bradford. They also maintained a home in Marshfield. A physician and surgeon, Edward Bradford was Dean of Harvard Medical School from 1914 to 1918. The Bradfords’ four children — Robert Fiske Bradford, Edward Hickling Bradford, Jr., Charles Hickling Bradford, and Elizabeth Bradford — lived with them. Edward and Charles Bradford were twins. Eliza Edes (Hickling) Bradford died in July of 1916 and Edward Bradford inherited 218 Beacon, which he leased to others. Edward Bradford died in May of 1926. Robert Bradford married in June of 1926 to Rebecca Crowninshield Browne and moved to Cambridge. He was a lawyer and later would serve as Governor of Massachusetts. Edith Bradford and her unmarried children continued to live at 220 Beacon. In September of 1940, Edith Bradford applied for (and subsequently received) permission to install an elevator and to convert 220 Beacon from a single-family dwelling into seven apartments. She continued to live at 220 Beacon and it appears that she did not actually convert the property inasmuch as the only residents listed there in the City Directories and Lists of Residents until the mid-1950s were Mrs. Bradford, her unmarried children, and her servants. Edward Bradford, a stockbroker, married in 1942 to Barbara Ross Seavey and they moved to Belmont. Charles Bradford, a physician, and Elizabeth Bradford, a teacher, continued to live at 220 Beacon with their mother. In 1946, the Bradfords converted 218 Beacon to apartments and, when the remodeling was completed, Edward and Barbara Bradford moved into one of them, and Charles Bradford moved into another. Edith and Elizabeth Bradford continued to live at 220 Beacon. Edith Bradford died in March of 1955 and Elizabeth Bradford moved soon thereafter. On August 15, 1956, 218 Beacon and 220 Beacon were acquired from Edward Bradford’s estate by Fred L. Arata and his wife, Annette Flossie (Crovo) Boggiano Arata. He was a retail liquor dealer and real estate investor. They lived in Brighton. The Aratas operated both properties as apartment houses. In September of 1957, Fred Arata applied for (and subsequently received) permission to remove a one-story ell at the rear of 218 Beacon. Fred Arata died in December of 1959, and on March 31, 1960, 218 Beacon and 220 Beacon were acquired from Annette Arata by Alvin L. Lipsky, trustee of the Alvin Lipsky Realty Trust. The properties changed hands and on April 24, 1961, were acquired by 220 Beacon Realty, Inc. (C. Thomas Zinni, treasurer). In January of 1963, it applied for (and subsequently received) permission to convert 218 Beacon from nine apartments to twelve apartments, to convert 220 Beacon from seven apartments to ten apartments, and to combine the two buildings into one property, with the address of 220 Beacon. Partial architectural drawings for the remodeling, designed by architect Lucien E. Geoffrion of Portsmouth, New Hampshire, are included in the City of Boston Blueprints Collection in the Boston Public Library’s Arts Department (reference BIN R-248). It was at this time that the façade was “modernized,” including consolidating the two entrances and relocating them to street level. In January of 1965, 220 Beacon Realty, Inc., applied for (and subsequently received) approval to increase the number of units from 22 to 23, conforming with the number of units actually built when it remodeled the building. On January 19, 1973, Francis J. Fortunato and David S. Kunian, trustees, foreclosed on a mortgage given by 220 Beacon Realty, Inc., and sold 220 Beacon to Joan Berig, and on September 17, 1975, it was acquired from Joan Berig by Sidney J. Hajjar. On December 30, 1977, Richard L. Wing, trustee of Rob-Greg Realty Trust, purchased 220 Beacon from Sidney Hajjar.